Last fall one of our friends found a vein of petrified clams while building a road near Mineral, Washington. The three foot thick, forty foot long clam vein was found at 2800 feet in elevation. We were intrigued by the petrified clams, and began investigating. 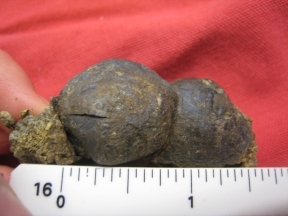 We started with Seattle-based geologist John LaManna, who said the clams had been found in the "Rocks of the Puget" group, which is a rock formation deposited during the Eocene epoch, about 40 million years ago. Next we sent photos of the clams to scientists at the University of Washington's Burke Museum. Turns out the clams are members of the genus Corbicula. They're common swamp clams that were plentiful in this area millions of years ago, before the Cascade Mountains were formed, when northwest Washington was covered with giant swamps and huge river deltas. Want some colorful language about molluscan fossils? 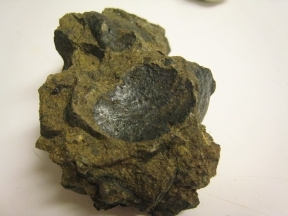 Check out this very eloquent NY Times piece about a fossilized oyster. 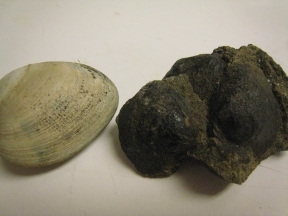 I have two large petrified clams – each one the size of a crabapple and both of them are in tact (both shells in perfect condition and in “closed” position, and the surrounding rock has broken off. Also have a rock the size of a shoe box that is full of those wormy things and small shells and other critters! 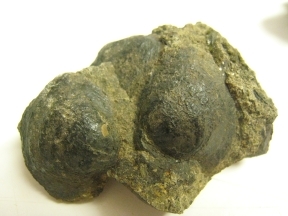 Love your web site – I’ve been going crazy trying to find information on the shells and the rock!